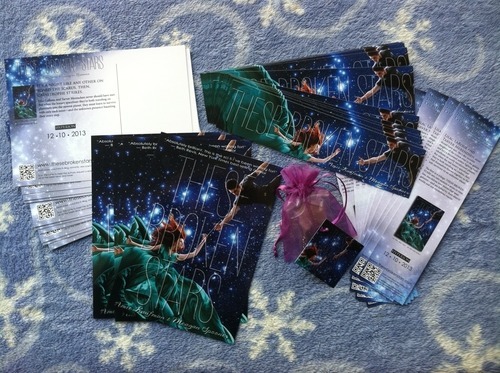 The increase in requests for THESE BROKEN STARS swag has fiiiinally made me get my act into gear and open a new PO box. Hooray! So! Once more my deal with you guys is open: send me a SASE and I’ll send you goodies. (If you don’t know what a SASE is, click here. Very important part of the process.) Signed bookmarks, post cards, and, if you’ve written a letter, you’ll get a reply from me too. I do my absolute best to answer everyone! For my address, click here. Remember, do not send me actual books to sign, as the PO box isn’t big enough to hold them—and you will get them back unsigned (or not at all, I’m a bit unclear on that!). 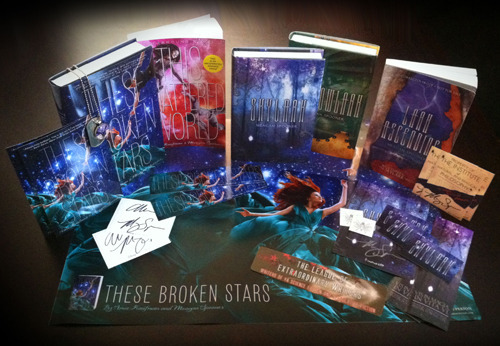 Please note that we do NOT have signed bookplates for THESE BROKEN STARS. In order to get signed copies, right now, you will need to order them from Malaprops, which has the added bonus that you’ll get a signed poster, too! I do, however, have bookplates for the SKYLARK trilogy available, so I am happy to send you as many of those as you require! Unfortunately, posters and necklaces are not included in this deal… they cost too much to ship, and our supply is too limited! Keep an eye out for contests, on those.